Are we deceiving ourselves about cohesion? I wrote back in the autumn of 2013 about how I found the endless march through text types to be ineffective in really securing children’s skills in Writing. I have spoken at several events since about how our perception of a joined-up curriculum in primary schools may not be conveyed as well as we like to the children we teach. We often build our writing tasks around a common topic or text and describe this as building a coherent curriculum, but too often the cohesion is in the topic, and not in the skill of writing. I have likened this in the past to trying to build a wall with bricks simply by dropping lots of randomly-shaped bricks and hoping they’ll fall into place. 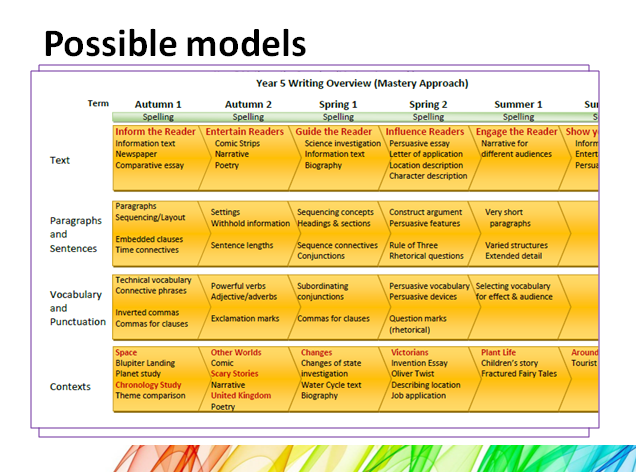 This year, I have tried to improve on this model by bringing greater coherence to the curriculum for Writing. That doesn’t necessarily mean moving away from thematic teaching, nor necessarily moving away from using the text types. However, my intention has been to adopt some of the principles of the mastery model that I discussed in my original blog: focussing on fewer aspects of writing for a greater length of time. Initially, this was based on identifying common strands through the units we were intending to teach (see details in first blog). Later, however, I began to adapt the text types we were using to ensure that we spent longer focussing on common strands. 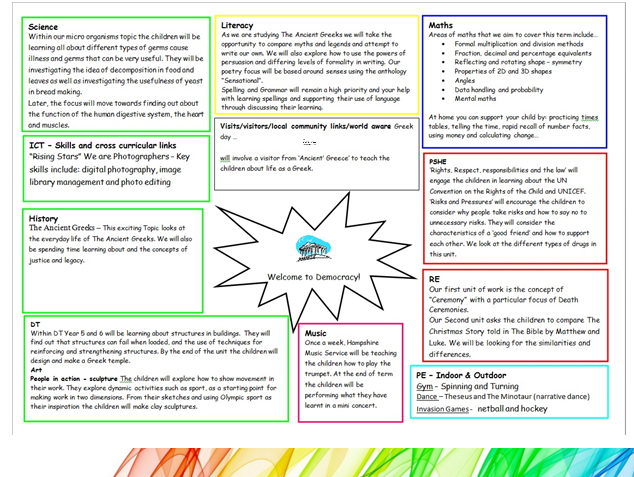 The idea here was to group the text types together slightly to ensure that we spend longer focussing on common features rather than racing through the various types hoping that some of the content we threw at the children would stick! Over the course of the year we continued our usual units of study, with writing tasks adapted to focus on some common themes. Generally I would say that this has been a successful approach. I’m not convinced that it made any substantial difference to our progress in Writing this year, but I do think that the children have been – and will be – able to retain more of their knowledge of each of the genres, and so will be able to draw upon that knowledge more effectively in the future. One of my concerns of the race through the text types has been the lack of retention of the main features, meaning that almost every unit of work becomes a revision unit rather than developing further skill, at first at least. I realise that this clear division into fiction and non-fiction blocks will fill some teachers with dread. Many teachers have a preference for one strand or the other, and so find the through of a whole half-term without their favoured type quite daunting. I can understand this, but our focus has to be on providing the most effective curriculum design to help our students to retain the key elements of learning. The advantages of this approach are hopefully evident at least in part. By focussing on some common areas over a half-term, there are opportunities for students to experience, employ and adapt the various features and techniques being taught. Significantly, it will be possible to share with parents more detail of what is being covered in Writing, since the focus will be narrower. This also allows us to use target-setting more effectively, as students are able to learn from early pieces in the half-term and apply the target in the next piece. 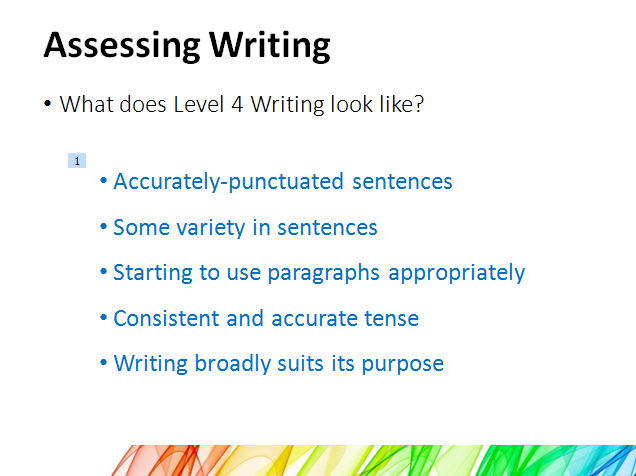 This replaces a system where too often children (particularly in upper KS2) have writing targets which are not particularly relevant to the text types/genres being taught. Obviously this is just a broad example which doesn’t link directly to any topics or themes that are being taught. As with all models, it wouldn’t be possibly to transfer it wholesale from school to school because it would work best when properly aligned with the wider curriculum. However, hopefully it may provide an interesting discussion point for schools thinking about tackling the content of the new curriculum? What place for testing in schools? I was in the cohort of students who had no national testing at all in primary school, the first cohort to be introduced to the National Curriculum from KS3, and the cohort whose KS3 National Curriculum tests were boycotted. Consequently, I am probably also in the last generation of English school students to have found their GCSE exams to be the first external test of their lives. I can see, therefore, why it is perfectly reasonable for teachers to claim that we survived perfectly well before national testing. I can see, too, the many arguments against high stakes testing for accountability, and even high stakes testing for assessment. I am not, though, in favour of the argument that says tests are automatically a bad thing, or that they automatically narrow the curriculum. As a middle- and primary-school teacher, I have been guilty in the past (indeed, still am guilty) of using tests from a national bank of materials purely for the purpose of tracking progress towards some end-goal. It is still commonplace across the country for primary students to sit “optional” tests in Years 3, 4 and 5 (and often still Y7, 8 and 9) to make these tracking judgements. It is these tests that give tests a bad name – particularly when the same test is used each year and some teachers turn this to their advantage. As with so many things, the problems of these tests are not the tests themselves but their uses. The need to gather data for tracking, and then desire to use that data for appraisal, and now even pay decisions, means that the focus of the tests is solely on the numerical outcomes, and far removed from the purposes of assessment. But we ought not let this flaw become an argument against testing, full stop. Testing in its purest form ought to be means of ascertaining whether or not some given knowledge of skill has been learned. True, it’s not perfect, but then nor is a system which requires one professional to track the progress of 30+ students at at time. Problems arise when we use standardised tests across schools which are in no way adapted to the taught curriculum. When carrying out mid-year assessments using optional QCA tests, it is inevitable that some of the content in the test will not have bee taught. What purpose then, these questions? True, it’s easier to photocopy an old exam to get an “accurate” result for tracking, but it tells us nothing about what has been learned. If testing is to be purposeful and meaningful then the content of those tests must be closely aligned to the content of the taught curriculum. That means teachers taking ownership of tests and assessment processes. We hear plenty about places like Finland with very few standardised tests, but in these cases it is wrong to presume that there is little or no testing. Rather the testing is in the control of the teacher, linked to the curriculum and is genuinely meaningful in its feedback to both teacher and students. That doesn’t automatically mean a burden of time and organisation for teachers. Organisations like testbase provide questions organised by topic, and publishers produce tests that are perfectly usable in such circumstances. For example, the Rising Stars new curriculum assessment materials would fit the mastery approach to Maths and provide a simple snapshot of attainment for teachers and students directly linked to the content covered. Testing absolutely has its place in schools, including with children in the primary school, but it must be an assessment of what has been taught and learned, not merely a tool to track progress on a numerical scale. What should the primary curriculum really look like? Or: What is the point of teaching them all this stuff anyway? I’m firmly of the belief that a majority (perhaps the large majority) of primary teachers share the same view: that we force-feed the kids in our classes a diet of breadth over depth because the curriculum, or the tests, or Ofsted, or SLT’s demand it. I think most primary teachers – particularly in infants and lower juniors – find themselves teaching things that they think are being delivered ‘too soon’ for the children in their care. This is not an argument for the molly-coddling of children, or the lowering of standards. Rather it is an argument for a rationalisation of what we try to teach. Coming from a middle school background, I have long wished that the 9-13 Middle Schools of the 70s had really taken off. I wish that the National Curriculum from its first inception had been built around the three main phases of first, middle and upper schools. Then, we might perhaps have had a different approach. Perhaps not in 1988, but maybe by now we might have recognised that very little really matters in the curriculum for children under 9 unless they are already confident with number and language. I raise this point because of a brief discussion I had with Heather (@HeatherBellaF) on Twitter this evening. She quite rightly pointed out that starting to teaching persuasive writing in Year 1 didn’t seem to be contributing to a significant growth in the transferability of such skill at GCSE level. And if the skills aren’t transferable after 10 or 11 years’ teaching, then what’s the point? My response was both complete agreement and disagreement. I disagreed because I think the point of teaching persuasive writing at KS1 is not to enhance the persuasive writing skills of 16-year-olds. In fact, I think the only purpose for any form of writing at KS1 is the practice of the basic skills of writing itself: the building of sentences; the use of capital letters; the simple formation of the symbols. However, I agree that expecting the teaching of varied genres at KS1 to have much impact on the ability of children to write for different purposes is frankly erroneous. So, what then, is the point of any such work? 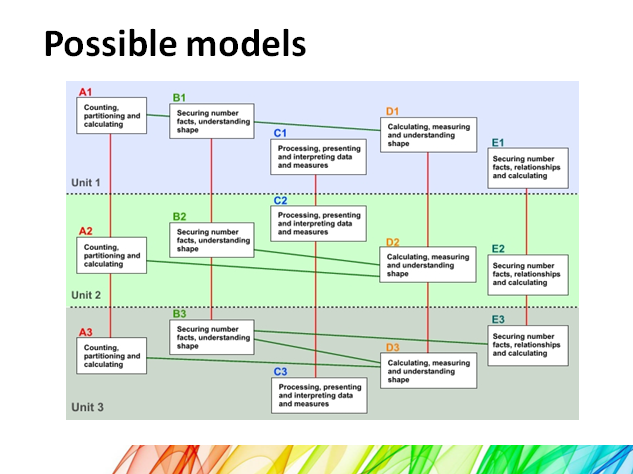 Looking back at the three-tier model, I’d be quite happy to see a curriculum substantially different to the one we have in place at the moment. This links in with Michael Fordham’s (@mfordhamhistory) post on an altered Secondary curriculum (which is well worth a read). In it, Fordham argues that English as a separate subject (as distinct from Literature) ought to be removed from the curriculum and its various aspects be properly addressed in domain-specific subject lessons. A genuine approach to Literacy across the curriculum. I’d be happy with that model, and what’s more, I think that it should be balanced by the inverse approach at first school age. First School (age 5-9): Only English, Maths and Modern Languages would be statutorily prescribed programmes of study. All other subjects currently in the National Curriculum would become part of required areas of study (Arts, Humanities, Sciences, etc.) which were intended to provide breadth of experience and support the core subjects. Physical Education would also remain statutory, with no programme of study. English and Maths programmes of study would be re-shaped to focus on Literacy and Numeracy. That is, all children would be expected to focus on developing oracy, and reading and writing basics (comprehension, building sentences, vocabulary, paragraphs, etc. ), without concern for genres or required areas of study.That’s not to say that children wouldn’t meet other genres, or contexts, but that these would merely be to support the core teaching aims, rather than becoming additional goals in their own right. Similarly, in Maths the requirements would focus largely on number work with relatively brief forays into shape as appropriate. 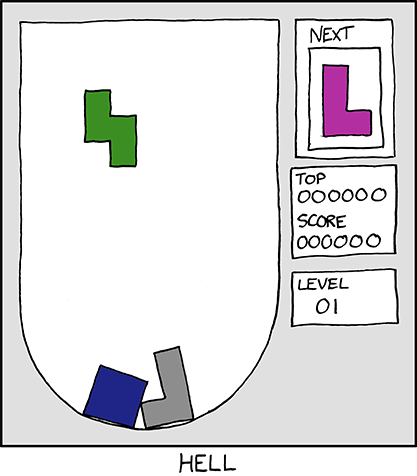 To be fair, the new Maths curriculum has moved a good way towards this. I have often heard many secondary maths teachers say they’d be happy to teach Y7s who came to secondary secure with number bonds and tables and relatively little else. I’d agree, but think we could move to that sooner. Let’s have all 9-year-olds ready for the next level. By removing the requirements to study particular programmes of study in all areas, it ought to be possible to move towards a system where the current Level 4 expectations could be met by the majority of 9-year-olds, rather than 11-year-olds. As Mark McCourt (@EmathsUK) said this weekend at the maths conference: Maths is like Jenga – pupils don’t fail because of weaknesses in the blocks at the top! Middle School (age 9-13): The current subjects of the National Curriculum would remain, although English and Maths would be radically re-shaped to reflect the changes in the first school range. English could now begin to focus more on literature, although as Michael Fordham suggests, ought not to need as much curriculum time as at present (often 7.5+ hours a week in primary schools) as literacy should be mastered by age 9. There would still be study of language and some genre-linked ideas, but the shift towards domain-specific writing should be reflected in a shift in timetabled hours. I would argue that Middle Schools used to do this, until the KS2 SATs demanded that they narrow their timetables to focus on meeting the odd demands of the tests. This model should leave more time in this phase for the study of subject knowledge. It would be far more sensible, for example, to begin a study of chronological history at age 9 and maintain it until at least age 16, rather than the current 7-14, and would be far more successful if students had already mastered the required literacy skill. Of course, this also would be combined with the middle school approach to specialism. We should expect all teachers of first school-age children to be expert in the teaching of early reading, writing and mathematics. We simply cannot expect that to apply right up to the age of 11 any more. It isn’t working. Of course, none of this is rocket science. Indeed, most of it fits with what many primary teachers already think: if we spent less time ploughing through genres, or tackling history concepts with 8-year-olds, we could focus more on the things that really matter, and give those kids the freedom to access all matter of higher level material as they got older. Surely that’s got to be better than the current system which tries to build all curriculum areas from age 5… and too often leaves interventions at 16 to try to plug the gaps the system leaves? Addendum: I ought to note that it wouldn’t necessarily be a requirement to change the whole system to a three-tier model. But I would argue quite strongly that expecting any primary teacher to be an expert in all areas of the curriculum up to Y6 level is never going to provide us with the best system; middle schools present a good solution to this; specialisation in small primaries is much harder. Conferences should always leave you knowing more than when you arrived. If nothing else this weekend I could have at least learned quite how much ‘north’ there is in the UK. Fortunately there was a lot more to Northern Rocks 2014, which made it a great day. Hopefully Emma and Debra will continue their fantastic work on the event and will be publishing videos of the various speakers, and I’m sure many more will blog, so I’ll leave the generalities of the day, but thought I would share the outline of my presentation for the many people who weren’t able to make this booked-out event. I wanted to try to present the idea that although the new National Curriculum at first seemed horrendous (indeed, in its first draft, it was!) and even now seems weighty, that there are some opportunities there for the taking. Despite claims about a slimmed-down curriculum, we ended up with a 200-page document just for KS1/2, and so it’s hard to see the freedoms at first, but there are some glimmers of hope. Firstly, I pointed out that of the 50,000 words, barely 1/3 of the content is actually statutory. Most primary teachers would agree that the core subjects should be very much at the heart of what we do, so it seems to me reasonable that a good chunk of the statutory content should come in those areas. Of the non-statutory stuff, a lot of it is actually very good guidance and support for teachers. 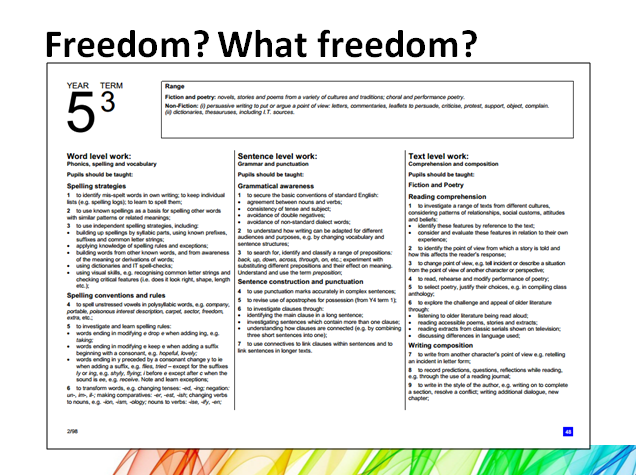 And of the foundation subjects, the freedom is evident. There are fewer than 200 words of content for primary music. The document in effect says to primary schools: ‘teach some art, teach some music, but most importantly, get the basics right’. I think we’d all agree with that, and actually the new document supports that aim. 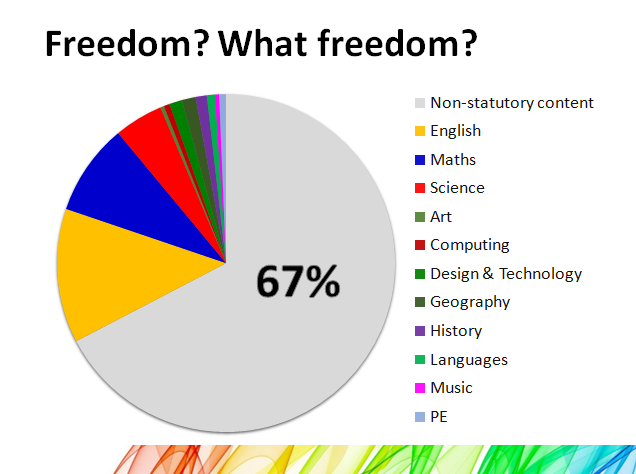 Schools are largely free to choose their ‘content’, as long as they get the maths and English skills sorted. Even the History that gets such as bad press isn’t awful. It is broadly the same as presently at KS1, and has just 9 topics to cover at KS2, which you can cover in a level of detail of your choosing. 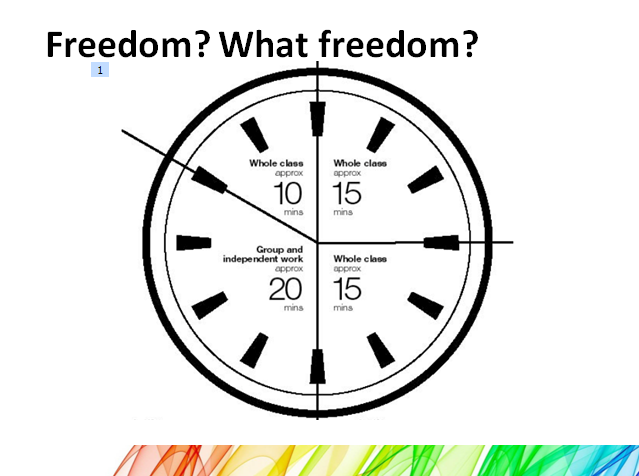 Take the freedom and make it work for your school! We ought not forget where we have been before when we look at the content we’ve been offered now. In comparison to the strict structure of the Literacy Hour and its many objectives, the new document generally is more light-touch. Although the strategies were never statutory, most schools followed them as thought they were; the new structure is very clear about what is statutory and what is not, and schools must take that as face value and make the most of it. In doing this, I think we genuinely allow children to build up a meaningful map of concepts around a model, rather than just throwing separate objectives at them day after day. It also makes target-setting more meaningful (since they will actually get a chance to tackle the target) and can make really good use of good classroom strategies such as learning walls over an extended period. I have written more about this mastery approach for English and also for KS2 Maths. Most primary teachers would agree that too often assessment has driven the curriculum. I have written before about how Assessment is not Tracking. The current system of levels does conflate the two, and too often it’s the latter that has been prioritised over the former. I proposed to the audience in the room that actually teachers have the knowledge to carry out meaningful assessment, and it doesn’t need to use pages and pages of highlighted bullet points. Perhaps what’s most important about this model is that schools can own it. Working together with partner schools or even across whole authorities, teachers can use their wide-ranging professional knowledge and judgement to design an assessment model that works for them. I genuinely think that among some concerns, there are lots of opportunities in the new primary curriculum, and it is now for schools, leaders and teachers to take those opportunities for themselves to build a meaningful curriculum for their students. As Mick Waters said at Northern Rocks: it’s time we stopped dancing to the tune of Ofsted or the department. I say, it’s time we make our own music!